A pregnant woman knows – there is nothing more important than getting enough nutrients for both her and her baby. When going to a doctor, a gynecologist or a family physician will always recommend prenatal vitamins in hopes of providing just that. While there is nothing fundamentally wrong with this approach most commercial one-a-day vitamins have virtually nothing good in them and may do more harm to some people than good. 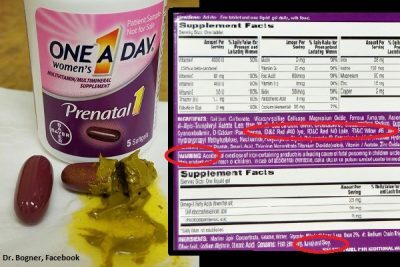 As Dr. Christian Bogner, obstetrician-gynecologist from Michigan, exposes on his Facebook page, many prenatal vitamins are made from myriad questionable ingredients — things that children and even adult’s bodies have a hard time processing, to say nothing of the potential toll taken on infants. The ingredients are even worse than they look. Many of the vitamin choices recommended by doctors are made by pharmaceutical companies like Bayer, who are not focused on health, but masking symptoms of various diseases. They are not the source to go to for health and longevity. Yet, they are the most common at doctors’ offices because that’s what the pharmaceutical representatives provide to doctors. One of the most popular One-a-Day vitamins is Prenatal 1 by Bayer. Calcium Carbonate, Microcrystalline Cellulose, Magnesium Oxide, Ferrous Fumarate, Ascorbic Acid, Dl-Alpha-Tocopheryl Acetate; less than 2% of: Beta-Carotene, Biotin, Cholecalciferol, Croscarmellose Sodium, Cupric Oxide, Cyanocobalamin, D-Calcium Pantothenate, FD&C Red #40 Dye, FD&C Red #40 Lake, FD&C Yellow #6 Lake, Folic Acid, Hydroxypropyl Methylcellulose, Niacinamide, Polyethylene Glycol, Polysorbate 80, Potassium Iodide, Pyridoxine Hydrochloride, Riboflavin, Silicon Dioxide, Stearic Acid, Thiamine Mononitrate, Titanium Dioxide (Color), Vitamin A Acetate, Zinc Oxide. Ingredients of the capsule: Marine Lipid Concentrate, Gelatin, Water, Glycerin, Ethylcellulose; Less than 2% of: Medium Chain Triglycerides, Oleic Acid, Sodium Alginate, Stearic Acid. First of all, there are three artificial food dyes (FD&C Red #40 Dye, FD&C Red #40 Lake, FD&C Yellow #6 Lake), which are absolutely unnecessary. Does it matter which color a capsule looks like when you are going to swallow it in two seconds? There are no benefits, yet the price our bodies pay could be high. Dyes are linked to a host of health issues. Red #40 is one of the worst ones and is associated with cancer risk, because it contain compounds benzene and 4-aminobiphenyl. All food dyes affect children the most and contribute to hyperactivity, irritability, allergies, aggressiveness, and learning impairment. There has been very little research done on how the dyes affect adults. There is even less research on pregnant women and how the dyes might affect their hormones and fetal development. However, the research we do have does not paint a pretty picture. When tested on pregnant rats, researchers found that artificial colorings lead to learning and memory problems. One documented case-study reports a 15-year-old pregnant girl going into anaphylactic shock from Yellow #6, one of the dyes that is the most commonly related to allergies. All current research shows that these dyes should not be used in food or vitamins and are best to be avoided completely. Next, we see that prenatal vitamins manufactured by pharmaceutical companies are full of synthetic vitamins. To no one’s surprise, there is nothing natural about them. “Aren’t all vitamins the same?” some might ask. Our bodies do not absorb synthetic vitamins the same way, because they are made with chemicals and because they are separated from other micro-nutrients. In nature, each vitamin is a complex combination of trace minerals and enzymes; synthetic vitamins are lacking that. The human body then tries to replenish what’s missing and depletes already existing nutrients in this process, according to Organic Consumers. Dl-Alpha-Tocopheryl Acetate is a synthetic vitamin E. This byproduct of a petrochemical dependent manufacturing process is only 12% as effective as natural vitamin E, and it has been linked to risk of DNA damage. Another synthetic vitamin that lacks in effectiveness is magnesium Oxide – a synthetic magnesium that is only about 5% effective. Besides not being effective, some synthetic vitamins are a serious health hazard. Niacinamide is a synthetic vitamin B3, and its side effects include liver failure. Ascorbic Acid is a synthetic vitamin C, which messes up the digestion. Then there is Cyanocobalamin – a synthetic vitamin B12; D-Calcium Pantothenate – a synthetic pantothenic acid; and Pyridoxine Hydrochloride – a synthetic vitamin B6, Riboflavin – a synthetic vitamin B2, Thiamine Mononitrate – a synthetic vitamin B1, Acetate – a synthetic vitamin A. Some research suggests taking too-high doses of vitamins, especially synthetic ones, can lead to birth defects, cancer, heart problems, and blood clotting with prolonged use. People taking the vitamins have reported feeling sick: insomnia, dizziness, upset stomach, nausea, vomiting, heart burn, increased morning sickness, and burping that tastes and smells like fish. But it’s not just the vitamins that are an issue here. Prenatal vitamin products can also contain many potentially toxic filler ingredients. Stearic Acid, Silicon Dioxide, Polyethylene Glycol, Croscarmellose Sodium and Microcrystalline Cellulose are potential neurotoxins. Hydroxypropyl Methylcellulose is a cellulose polymer that is used as a gluten and gelatin alternative. It can be disruptive to digestive and endocrine health. Polysorbate 80 is a synthetic compound found in food, cosmetics, and drugs. Animal tests linked it to increased risk of cancer and adverse reproductive effects. One study linked it to infertility in mice, another to anaphylactic shock in pregnant women. Titanium Dioxide is a useless filler in vitamins. It’s also a potential carcinogen and can lead to immune dysfunction in the body with too much use for some people. There is also a warning on the vitamin box that it contains soy, which is most likely to be GMO. Between artificial dyes, synthetic vitamins, and toxic additives, prenatal vitamins made by pharmaceutical companies are best to be avoided. The good news is – there are better options. When looking at the prenatal vitamins debate, medical opinions are all over the board: from absolutely necessary, to useless and even potentially harmful (when synthetic). Looking at the big picture, it is not that pregnant women need to take vitamins, it is that they need to make sure that they are not low on any vitamins or minerals required for them and their baby to be healthy. Because everyone has a different diet and absorbs nutrients differently, this is where is could be beneficial to talk to a naturopathic doctor and get tested for nutritional deficiencies. Their ingredients are gluten, dairy and soy-free, vegetarian, non-GMO, and are derived from carrots, oranges, brown rice, cabbage, and broccoli. The only ingredient (other than the gluten) that might not agree with everyone is Saccharomyces cerevisiae – yeast used for brewing and baking. It has a lot of nutritional properties but for some people may trigger a digestive upset. For over 72% of people who rated it 5-stars, this does not seem to be a problem. If you’d like to avoid the yeast, you can look into prenatal multivitamins by the Garden of Life. Their organic vitamins are sourced from curry leaf, hummingbird tree leaf, guava, amla berry, sea kelp, holy basil, annatto, lemon, moringa, apple, beet, broccoli, carrot, tomato, spinach, strawberry, tart cherry, blackberry, green bell pepper, Brussels sprouts, blueberry, garlic, green onion, raspberry, parsley, cauliflower, red cabbage, kale, cucumber, celery, and asparagus. If you cannot get enough vitamins form food, these two companies above are packed with good ingredients, and contain none of the bad ones. You can sleep easy knowing you are doing both you and your baby good.